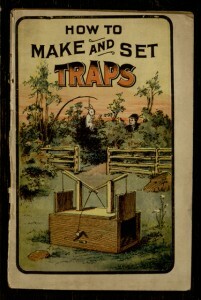 The latest eBook release produced by our collaboration with Distributed Proofreaders is How to Make and Set Traps, another title from Frank Tousey‘s series of Ten Cent Hand Books. 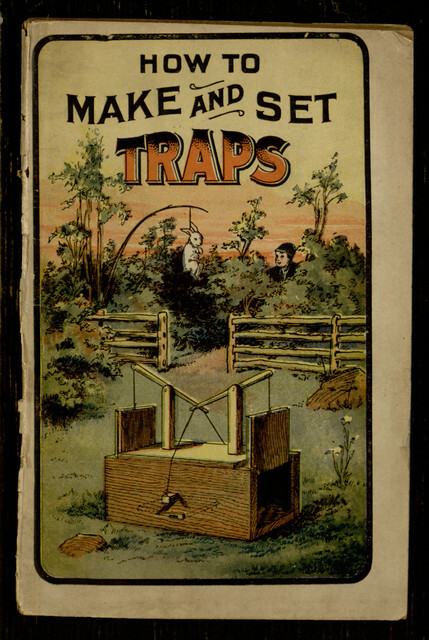 Like many of the books in this series, How to Make and Set Traps appears to have been cobbled together from multiple (likely British) sources. Some of the parts seem out of order and some details are obviously missing. What is left makes for an interesting read, mixing dense and convoluted details of trap-building with anecdotes about animal behavior, reflections on the definition of “vermin,” and a strong sense of the Victorian era. Still there is nothing difficult about mole catching, and the most stupid boy could render himself successful if he observes a little and follows the directions I am about to give. Emphatically I declare it—a weasel never relinquishes its quarry till the life’s blood has been sucked and the brain extracted and eaten. For many more nuggets of wisdom along these lines, you can find the whole book available for download or online reading through Project Gutenberg.